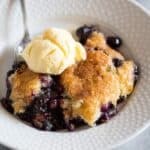 Our FAVORITE Blueberry Cobbler recipe made with fresh or frozen blueberries and basic pantry ingredients. The end result is the perfect cobbler! Slice butter into pieces and add to a 9x13 inch baking dish. Place the pan in the oven while it preheats, to allow the butter to melt. Once melted, remove the pan from the oven. Add blueberries, sugar and zest to a bowl and stir to combine. In a separate bowl mix together the batter ingredients: flour, sugar, baking powder, and salt. Stir in the milk, just until combined. Pour blueberries over melted batter in pan. Drizzle batter over the top. Sprinkle with a little bit of cinnamon. Bake at 350 degrees for about 35-40 minutes, or until lightly golden on top. Serve warm, with a scoop of ice cream, if desired!